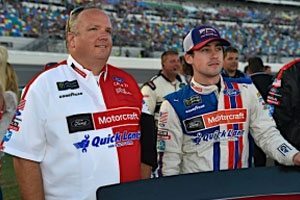 Lighting in the vicinity of Kentucky Speedway on Friday evening forced an early end to qualifying and left Ryan Blaney and the No. 21 Motorcraft/Quick Lane Ford Fusion with the sixth starting position for Saturday night’s race. His speed was the best of the Ford contingent, which placed three drivers in the top 10. It was Blaney’s fifth-straight top-10 qualifying performance, his seventh in the past eight races and his 13th top-10 start in 18 tries this season. As has been the case most weeks this season, the Motorcraft/Quick Lane team unloaded a fast Ford Fusion. 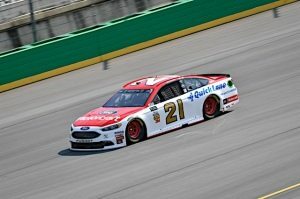 Blaney was fourth fastest in the two practice sessions on Friday, posting a best lap of 186.059 miles per hour in the first session and running 186.458 mph in the second. In qualifying, Blaney was seventh fastest in the opening round with a lap at 188.541 mph, then stepped it up to 189.560 mph in the second round. Lightning forced an end to qualifying before the third round could be run, and the field was set based on second round speeds. Blaney said he believed he was poised to run an even faster lap in the third round if the weather had cooperated. Saturday’s 267-lap, 400-mile race is scheduled to start just after 7:30 p.m. with TV coverage on NBCSN.